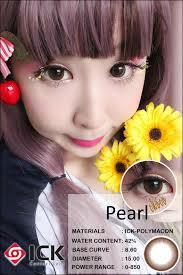 The ICK Pearl Choco Lens blend so well with the color of my eyes. The lens was easy to wear and comfortable. I can easily carry this lens as my eyes are light brown. Moreover, it looks natural on me and not too big enlargement to my eyes. Got my first pair of ICK Pearl Choco Lens from LensVillage. I actually wanted something that is brown in color and with enlargement so I went for this lens. Turns out to be great and exactly like something I want. The lens gave me a little dolly look and natural look at the same time. The lens is light so it's pleasant to wear. In my opinion, i think that it is suitable for work and casual occasions. It is definitely a great choice!